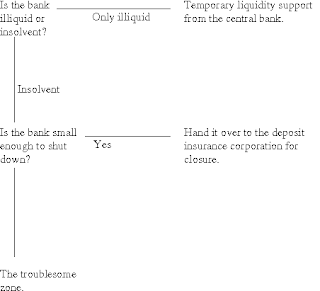 When a bank gets into trouble, the first question to ask is: Is it insolvent or is it just illiquid? If it's merely illiquidity, then central banks should provide temporary liquidity support to a fundamentally sound firm. This liquidity backstop has always been a crucial role through which governments make the concept of a bank possible. The moral hazard involved here is controlled by making this liquidity support extremely expensive, so that banks should think thrice before using it. These days, countries generally separate out the function of monetary policy, which is placed at an independent central bank, from the function of financial regulation and supervision which is placed at a financial regulator. In this case, a proper interface between the two agencies is required. To some extent, liquidity support is about merely having a central bank window where good quality assets are repoable at a penal rate (and with haircuts reflecting collateral risk). To some extent, this requires the financial regulator to make a call on whether a bank is merely illiquid or insolvent. When a bank is insolvent, there are two cases. If it is a small firm, then it should just get wound up. The depositors should get paid based on agreed-upon rules of deposit insurance. The US has an agency named the FDIC which has done a great job of closing down dozens of banks in the current crisis. The UK did not have such a capability, and after the crisis, this has been created. India does not have this capability (even though technically, a deposit insurance corporation exists). A key task in India's financial sector reforms is that of setting up such a capability, to swiftly close down a bank, and pay depositors upto Rs.100,000 per person. Chapter 6 of Raghuram Rajan's report is the best blueprint out there about setting up a deposit insurance corporation, and other dimensions of improving systemic risk (see `V. Preventing Crisis and Dealing with Failure'). In earlier years, we used to think that if deposit insurance did not exist or was set very low, then it would help induce greater market discipline. Depositors would tend to avoid banks which were fragile; their cost of funds would go up. Financial weakness would yield reduced profits and generate incentives to shore up the firm. I would have liked to live in that world. Sadly, real world politics just does not allow banks to go down calmly under such circumstances. Hence, as Jim Hanson and Gerard Caprio used to say: "There are only two kinds of deposit insurance. That which you knew you had, and that which you did not know you had." Hence, I think we have to all give up on designing a world with miniscule or no deposit insurance. A value like what we have in India, of roughly 2x of per capita GDP, seems quite adequate to me. That leaves the troublesome case of insolvent banks which are too big to fail. In India, that would be a firm like SBI or ICICI Bank, where closing the firm down is not easy in the short term. What is the alternative? Do nothing? There is a full consensus that the worst strategy is the Japanese approach: of doing nothing, of a banking regulator which aids and abets banks in violating equity capital requirements, and hopes that growth will take care of the problems. The big word `forbearance' is used to convey banking regulators who don't insist on banks being adequately capitalised. In this strategy, the problems of banks weigh down the economy. Both the banks and the economy get into a protracted malaise. The good bank / bad bank strategy. The traditional model, which has been used in many countries, is to partition the ailing firm into a "good bank" and a "bad bank". First, the government takes over the firm (i.e. the private shareholders get returns of -100%; they get expropriated). The healthy assets and businesses are put into the "good bank" and the difficulties are concentrated into the bad bank. The good bank is quickly privatised - typically at a good price because it is a clean and healthy business. The bad bank is put under public sector management. The distressed assets are slowly processed, and some taxpayer money gets used to close it down. In India, this strategy was used with UTI. UTI was carved up into one piece (what is now UTI MF) which should go on to become a modern financial firm much like ICICI or HDFC, and all the trouble was kept in SUUTI. There are two areas where this was not a textbook good bank / bad bank strategy at work: (a) Good UTI was not swiftly privatised, and (b) Bad UTI did not have complicated NPAs which required resolution. The `bad assets' often yield more value when patience and care is applied to working on them. In the present crisis, the consolidation of home loan assets is likely to create significant value. By and large, US home prices have dropped 40%, but home loan securities have dropped 80%. A good part of this gap, of around 40%, can be captured by consolidating the home loans and working on them. The good bank / bad bank model is nice to describe, but it's actually very hard to do in practice. A key difficulty of this approach is the management difficulties associated with a public-sector dominated process of sifting through the assets, auctioning off the good bank, and hands-on running the bad bank until it is closed down. This requires immense governance capacity on the part of the public sector. As an example, there can be political pressure upon a public sector bad bank, to not evict homeowners who have defaulted on their home loans. Or if the bad loans have been given to industrialists, then they would lobby with politicians to get the (public sector) bad bank to not vigorously enforce on the bad debt. There are also concerns about competence and incentive: how would the public sector bring in the right employees for doing all this, and motivate them properly? It is too easy for a government to do badly on recovering from NPAs, and make up by putting more taxpayer money into the recapitalisation. And the entire good bank / bad bank model is violated if the good bank is not privatised. In a place like India, there's a danger that the private bank which is taken over will just be absorbed into the public sector and never ejected out again. The good bank / bad bank model worked well in places like Sweden, but it's application into developing countries should be viewed with caution, since it requires governance capacity which is often not found in the third world. It's striking to see that in India, this approach was roughly used with UTI, where the assets in the `bad bank' were mostly plain equities. There was no complex NPA resolution required. With situations like Indian Bank, the good bank / bad bank model was not used; instead the government just put a lot of equity capital into Indian Bank to pay for the bad loans. Or, consider Global Trust Bank -- there was no process of good bank / bad bank followed by privatisation of the good bank: Global Trust Bank was just merged into a public sector bank, we grew the footprint of the public sector, and that was that. Housing assets of banks will be sifted and organised (on a voluntary basis by the distressed banks) and put up for auction. A private investor will put up roughly $6. The government will come in as an equity investor with a 50% stake, bringing in another $6. The FDIC will enable debt of $84. With this $100 in hand, the private investor will buy a pool of home loans (at the auctions). These assets will go off the balance sheet of the bank. The private investor will then handle the assets until resolution. In this arrangement, the private investor has very strong incentive to recover more than $84 out of the pool, which is required to repay the debt, since he keeps half the upside above that. This approach harnesses the creativity and hunger of the private sector in order to workout the bad assets. This is likely to work better than relying on a public sector dominated approach. And yet, the government keeps half the upside after the debt has been paid off. What will force the bank to sell off bad assets? A banking regulator who does not engage in forbearance, and a government that holds out a recapitalisation strategy. These two, put together, would generate incentives for the bank to honestly identify bad assets and sell them off. But there is complicated game theory in this. If the bank is too big to fail, then the threatpoint of a regulator is actually limited. The government needs levers to bring into play in the event that the bank sits tight and refuses to cleanup its balance sheet by selling off bad assets. And if a recapitalisation strategy is not articulated, the bank will not like doing trades which visibly generate massive losses on the P&L. A key strength of this approach is that nationalisation or quasi-nationalisation is avoided. The big banks sell assets through auctions which should, hopefully, convert them into good banks. The "bad banks" are basically private equity funds, where the private sector provides the hunger and the government enables their financing. The private sector will do a better job of recruiting and incentivising people to work for these `bad banks', and they will vigorously recover value from a portfolio of bad assets, without the risk of political interference. Let's think write down some imaginary values to fix the intuition. Suppose there was a bank with total assets of Rs.100, equity capital of Rs.10 (i.e. 10:1 leverage), and suppose it had found itself holding Rs.50 of non-performing assets. These bad assets are auctioned off; suppose the auction-discovered price works out to Rs.25. First, let's analyse what happens to the private equity funds which buy the bad assets. On average, private equity funds are unlikely to lose money in this situation where they have voluntarily picked the price that they would bid. Hence, there's a good chance that the private equity funds will manage to recover more than the Rs.25 that they put up in the auction. With this, the government guaranteed debt (that was taken up by the private equity fund) gets repaid, and maybe the government makes some money by virtue of being a 50% shareholder in these funds. That leaves the bank. It has made a loss of Rs.25 owing to the auction. This blows through the original equity capital of Rs.10. A recapitalisation strategy is essential. Suppose the government comes through with preference capital of Rs.25 at an interest rate that's higher than the average cost of financing of the government. Now the bank faces the burden of paying off this debt gradually. But it's doing so from a fundamentally solvent position. If all these things work out correctly -- the preference capital that the government puts into the bank is serviced properly, and the private equity fund manages to repay on the government-guaranteed debt that it has taken up, and the private equity fund even pays the government something for the 50% equity stake -- then all this involves no cost to the taxpayer. PPIP is not yet working properly in the US. And yet, at the level of this broad presentation, it appears to have many interesting features. I think it constitutes an important alternative to the good bank / bad bank model. It is particularly relevant in developing countries, where the governance capacity required to make the good bank / bad bank model work is harder to find. I find some fascinating similarities with other aspects of debates on handling bad assets of banks. In 1999-2001 there was a lot of pressure, in India, to do as the East Asians had after their banking+currency crisis: to create an `Asset Reconstruction Company' in the public sector with Rs.10,000 crore of capital, have it issue Rs.90,000 crore of government guaranteed bonds, and use this money to buy Rs.200,000 crore of NPAs and thus cleanse the banking system of this burden. This public sector `ARC' would then spend a decade on doing resolution of bad loans, while the banking system would get back to giving out new bad loans. I think India did well in avoiding this model. Instead, the strategy used was to remove the legal/accounting/regulatory bottlenecks through which specialised firms like ARCIL could come about, which obtain resources from the private sector where they have to pass the market test, which voluntarily buy bad assets that are voluntarily sold by banks, and then use SARFAESI to get a good return on capital. Government put zero money into ARCIL. ARCIL and its ilk look a lot to me like the private equity funds described in the structure in the US above. The key difference is that while in India, the government has had capital controls which hinder the fund-raising of these firms, in the US, the government is supporting the fund-raising of these firms through guarantees on debt and half of the equity financing. Re PPIP - Recent changes in valuations methodology (I think from the last G20?.. not sure)i.e. a move away from mark-to-market means that banks will potentially be reluctant to participate. If they can keep assets on their balance sheets at higher values (above distressed market prices) why would they sell and incur actual losses on these assets, thereby requiring more capitalization? The PPIP is at market, so the assistance is only to the buyer. The non Bank participants have been identified (only 5 large Fund managers are currently allowed to participate). It is a good idea in theory, but PPIP may not work. My little conspiracy theory is that "Big Bank" managements are using it as a lever against *unwarranted* interference from the Government (read compensation limits). Changing the compensation structure is extremely painful. Firms spending time and effort on that change will lose the opportunities that the current flux creates. PPIP is not the problem, but having accepted the TARP and TALF without having any choice, "Big Bank" managements are fighting back with the perverse tools of not making their own balance sheets better. I have to suppose that they believe that they can survive this fight. However, it does mean that the economy will remain depressed for longer. You make it sound too easy. What if there's a bunch of people who stole money from the bank? You want to just forgive all sins and set an easy path to recovery (albeit with little taxpayer money)? The banks do take awful lot of time to recover bad loans. So they adopt a strategy of delay in granting loans in times of economic diffficulties as at present. That pushes marginal firms into sickness. Most of their recoveries happen only when the business cycle turns. A very good analysis of what the authorities in the US aim to achieve with TALF, PPIP etc.